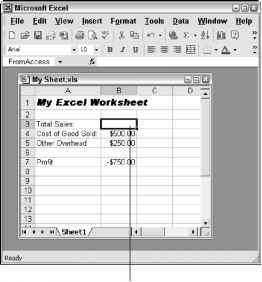 Perhaps the most straightforward method of providing help to your users is to use the features contained in Excel itself. The primary advantage of this method is that you don't need to learn how to create HTML Help files —which can be a major undertaking and might take longer to develop than your application. ♦ Cell comments: This is about as simple as it gets. ♦ A text box control: A simple macro is all it takes to toggle the display of a text box that shows help information. ♦ A worksheet: A simple way to add help is to insert a worksheet, enter your help information, and name its tab Help. When the user clicks the tab, the worksheet is activated. ♦ A custom UserForm: A number of techniques involve displaying help text in a UserForm.